When the weather is nice there's nothing like enjoying a good meal or drink outside. Memphis is a city fortunate enough to have pleasant weather for most of the year so many bars and restaurants have patios or outdoor space. Of course some venues are better than others. Here's a guide to where to sit under the sun in Memphis. Alfred's On Beale has it all. It is located on the famous Beale Street and hosts live music regularly. The ambiance is fun with spirited people mingling and dancing. It also has award-winning barbecue and ribs. To top it all off it has not one but two outdoor patios. You can sit outside and soak up the fun of Beale Street, all without leaving the table. At first glance Bayou Bar & Grill feels like an indoor space. It's Mardi Gras themed and there are beads hanging from the ceiling, neon lights, and dark lighting. But this bar has a patio where you can indulge in cajun food (think po' boys), southern treats, and lots of beer. And it's roomy, so you'll most likely find a good space to spend a few hours. 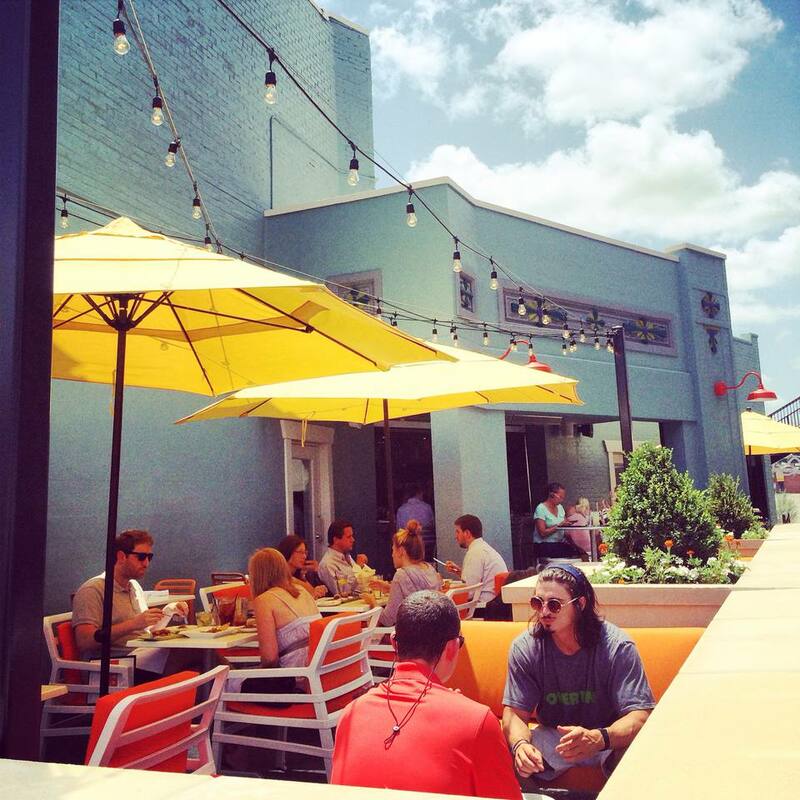 At Boscos Square, located in Overton Square, the outdoor patio is larger than the inside space. It makes numerous beers (including some that are award winning) on site, so on a nice summer day it's packed with diners trying some or all of them. The restaurant is also known for its wood-fired pizza. It also serves burgers, fresh fish, steaks, and more (all paired with beer.) On Sundays it's especially popular for brunch. The scene is friendly and fun. Brookhaven Pub and Grill is where you go to watch the University of Memphis Tigers Basketball team play. Fans flood the patios where you can sit back, enjoy some pub grub, and catch the game. The bar also has buckets of beer and drink specials, so you can save money while you're partying. It's the place to be after work or on weekends. Cafe Olé is located in the trendy Cooper-Young Historic District. It's where young professionals gather to spend the day drinking, hanging out, and eating great food. This restaurant, known for its Tex-Mex and Mexican fare, might have one of the popular patios in Memphis. One of the most popular dishes is the made-to-order guacamole where you can choose which ingredients you want the server to mash into the avocado. They also serve firesticks, which are tempura-fried jalapeño halves stuffed with lobster, corn, cilantro, and cream cheese. When the sun is out, every table is full with happy people unwinding in the garden. Another favorite bar in Cooper-Young is Celtic Crossing. It might be popular to because of the Irish-inspired dishes like Corned Beef Crustinis. Or it could be because the Guinness just tastes better here. But we guess it's probably because of the patio. It's always full of diners. If it's full, don't leave. It's worth the wait. This bar also shows soccer games, even ones taking place in Europe early in the morning. They serve a special menu including DJ's Breakfast Sandwich, a crowd favorite that comes with fried egg, bacon, avocado, and red peppers on Focaccia loaf. Loflin Yard is one of the newcomers to Memphis. It's located in the heart of downtown, in a space that used to be a barn for horses that drove carriages. Now it's a bar and restaurant with over an acre of green space. Order a family-style beef brisket plate or a po' boy sandwich and bring it outside to one of the lawn chairs. The cocktails, many of which are made with locally made spirits, are not to be missed. Railgarten is a Memphis bar located on 1.5 acres of land. It has everything you can imagine for a day outdoors: a playground and sand pit, a volleyball court, bonfires, lawn chairs, a traditional ice cream parlor, even an outdoor tiki bar. If it's a beautiful day, there is no other place you want to be. You can spend all day here and never get bored. The small patio at Venice Kitchen is always full, but the food is so good that it's worth the wait. They serve Creole-inspired Italian recipes, so you'll get much more than your regular Italian food here. Try the special pizza for the day for just $10. It comes in varieties like Bacon Cheeseburger and Chicken Tuscany. There is something about sushi that screams being outside... perhaps by an ocean? While Memphis doesn't have that, it does have an incredible sushi restaurant named Sekisui with a patio. Some nights in the summer the restaurant even hosts live music on the patio. The music will serenade you as you try all the creative rolls and dishes. Try the Hawaiian roll with crab, shrimp, cucumber, and pineapple. It's topped with tuna and avocado. Another Beale Street bar, Silky has a huge patio to accommodate its equally huge crowds on any given weekend night. The bar claims to feel like St. Patrick's Day year round, and it's true. There are green beads everywhere, and everyone is partying all the time. But the restaurant actually specializes in Southern fare. Get a sampler of the BBQ ribs, and bring it out to the deck. They pair perfectly with Guinness.